The picture above was taken at an Amish farm in Hardin County, Ohio (we’ve mentioned this settlement already this summer, see the unusual buggy post). Can you guess what’s happening here? The family only does this once a year. Luckily, that was the day I stopped by! Making Apple Butter! Yum! Yum! The very first thing I thought was apple butter and I see others thought that too. Either making apple butter or cooking down sorghum. Nice to fix the fire that way, I bet….no standing in the smoke while you’re stirring and surely wouldn’t take near so much wood. We always had an open fire, not near so handy. My first thought was Apple Butter. Since we have no true idea what time of year this is, it could be late winter and maple sugar boiling time. Making lye soap makes sense, but I think that apple butter would be made inside the house. The copper kettle and the long handled stirrer is a dead give away for apple butter! YUUUUUMMMMMMMMM!!!! My mouth is watering:-) Interesting set up they have there, I wonder if it helps the fire to burn more efficiently and therefore use less wood or maybe cut the boiling time down? I don’t know how you make apple butter but my guess is lye soap. I just made some grape jam last weekend, since my friend’s concord grapes are ripe now (“yearly”). My first guess was they’re making maple syrup, second would be soap. Reading Christina’s post (and others’), I suddenly have a major craving for apple butter! As I remember making apple butter, if somebody wasn’t standing there all the time, stirring, it would burn! Gi, I would say that it’s apple butter as a friend of mine who is Mennonite makes hers this time a year. She uses a large pot like that. Do they make maple syrup in Ohio? I think it is lye soap as well. 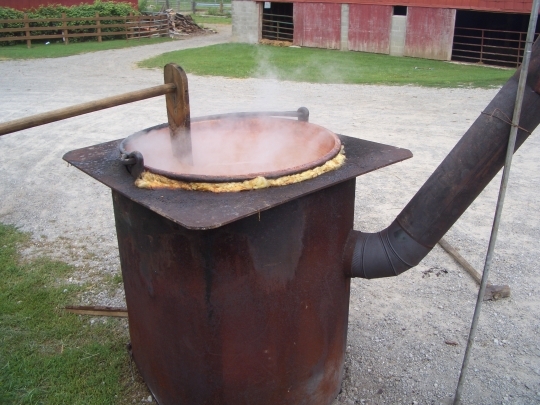 I would say making maple syrup as I think this is only done once a year when they get the sap from the trees…. And you can make moonshine anytime…..not just once a year LOL…. I remember reading somewhere that the Amish does make homemade soap….but I don’t think they can only make it one time a year…. My first thought was carmel corn. My wife makes soap in the house, which would have to be much easier than outside. If you are not looking at it while you stir it, how do you know when it reaches trace? Looked like a giant omelet sticking out to me. I have a friend who peddles a semi-local apple butter maker’s wears at an event we both volunteer at, he always sells the smallest bottles you can get, but you can get much bigger. 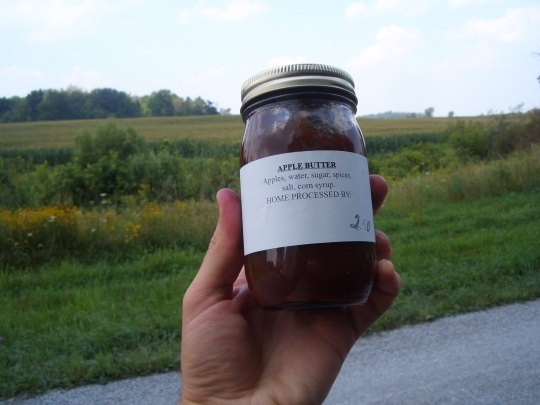 Do you think apple butter is a Germanic thing? My father complains that the stores that cater to the Italian community won’t sell it, but you have to go to a German food store to get some, locally. All you folks who said apple butter, well done. They were boiling it down here, I can’t recall the exact volume, but what they originally had in there was going to get cut in about half when it had been boiled down and condensed. This family runs a small store on their property as well where they sell the butter along with a wide variety of other foods, baked goods, etc. The smell of this process was what reeled me over–a mix of baking apple and the earthy sweetness of burning wood. Had to get a jar then–see above where I’ve update the post with a photo of the final product!